Professor Kweon received the B.S. and the M.S. degrees in Mechanical Design and Production Engineering from Seoul National University, Korea, in 1981 and 1983, respectively, and the Ph.D. degree in Robotics from the Robotics Institute at Carnegie Mellon University in 1990. He worked for Toshiba R&D Center, Japan, and joined KAIST in 1992. He is a professor of electrical engineering (EE) and the director for the National Core Research Center – P3 DigiCar Center at KAIST. He served as the department head of Automation and Design Engineering (ADE) at KAIST in 1995-1998. Professor Kweon's research interests include computer vision and robotics. He has co-authored several books, including "Metric Invariants for Camera Calibration," and more than 300 technical papers. He served as a Founding Associate-Editor-in-Chief for “International Journal of Computer Vision and Applications”, and has been an Editorial Board Member for “International Journal of Computer Vision” since 2005. 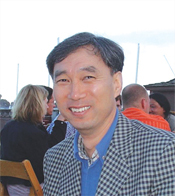 Professor Kweon is a member of many computer vision and robotics conference program committees and has been a program co-chair for several conferences and workshops. Most recently, he is a general co-chair of the 2012 Asian Conference on Computer Vision (ACCV) Conference. Professor Kweon received several awards from the international conferences, including “The Best Student Paper Runnerup Award in the IEEE-CVPR’2009” and “The Student Paper Award in the ICCAS’2008”. Professor Kweon has also earned several honors at KAIST, including the 2002 Best Teaching Award in EE. In 2001, he received the KAIST Research Award. He is a member of KROS, ICROS, and IEEE. Sungho Kim, In So Kweon, "Robust Model-based Scene Interpretation by Multilayered Context Information", Computer Vision and Image Understanding (CVIU), March 2007. Ho-Won Kim and In So Kweon, "Appearance-Cloning: Photo-Consistent Scene Recovery from Multi-View Images", International Journal of Computer Vision(IJCV), Volume 66, pp163 -192, Number 2, February 2006. Kuk-Jin Yoon and In-So Kweon, "Adaptive Support-Weight Approach for Correspondence Search", IEEE Transactions on Pattern Analysis and Machine Intelligence (TPAMI), vol. 28, no. 4, pp. 650-656, 2006. Jun-Sik Kim, Pierre Gurdjos, and In So Kweon, "Geometric and algebratic constraints of projective concentric circles and their applications to camera calibration", IEEE Transactions on Pattern Analysis and Machine Intelligence(TPAMI), vol. 27, No. 4, pp 637-642 2005. Sungho Kim, In So Kweon, “3D Target Recognition using Cooperative Feature Map Binding under Markov Chain Monte Carlo”, Pattern Recognition Letters, 27 (7): 811-821, 2006. Gijeong Jang, Sungho Kim, Inso Kweon, "Single-camera panoramic stereo system with single-viewpoint optics", Optics Letters, Vol. 31, No 1, pp. 41-43, January 2006. Sungho Kim, Kuk-Jin Yoon and In So Kweon, "Object Recognition using Generalized Robust Invariant Feature and Gestalt Law of Proximity and Similarity", 5th IEEE Workshop on Perceptual Organization in Computer Vision (in CVPR'06), New York NY, 2006. Pierre Gurdjos, Jun-Sik Kim and In So Kweon, "Euclidean Structure from Confocal Conics: Theory and Application to Camera Calibration", in Proceeding of the IEEE Conference on Computer Vision and Pattern Recognition (CVPR), pp. I: 1214-1221, July, 2 2006. Kuk-Jin Yoon and In So Kweon, "Stereo Matching with Symmetric Cost Functions", in Proceeding of the IEEE Conference on Computer Vision and Pattern Recognition (CVPR) 2006. Kuk-Jin Yoon and In-So Kweon, "Locally Adaptive Support-Weight Approach for Visual Correspondence Search", to appear in Proceeding of the IEEE Conference on Computer Vision and Pattern Recognition (CVPR), 2005. Jun-Sik Kim, and In So Kweon, "Semi-metric Space: A New Approach to Treat Orthogonality and Parallelism", LNCS 3851:529-538 (ACCV'06), 2006. Kuk-Jin Yoon and In So Kweon, "Correspondence Search in the Presence of Specular Highlights Using Specular-Free Two-Band Images", Lecture Notes in Computer Science (Asian Conference on Computer Vision (ACCV'06)), vol. 3852, pp. 761-770, 2006. Jun-Sik Kim and In So Kweon, "Infinite Homography Estimation Using Two Arbitrary Planar Rectangles", LNCS 3852:1-10 (ACCV’06), 2006. Sungho Kim, In So Kweon, "Scene Interpretation: Unified Modeling of Visual Context by Particle-based Belief Propagation in Hierarchical Graphical Model", LNCS 3852:963-972 (ACCV’06), 2006. Sungho Kim, In So Kweon, "Biologically Motivated Perceptual Feature: Generalized Robust Invariant Feature", LNCS 3852:305-314 (ACCV’06), 2006. I. Kweon and T. Kanade, "Extracting Topographic Terrain Features from Elevation Maps", Computer Vision, Graphics, and Image Processing(CVGIP): Image Understanding, March 1994. I. Kweon, K. Onoguchi, M. Watanabe, Y. Kuno, "Sonar-based Behaviors for Behavior-based Mobile Robots", Transactions of The Institute of Electronics, Information and Communication Engineers (IEICE), April, 1993. I. Kweon, T. Kanade, "High Resolution Terrain Map from Multiple Sensor Data", in the Special Issue on 3-D Vision of IEEE Transactions on Pattern Analysis and Machine Intelligence (TPAMI), Vol.14, No. 2, February 1992. I. Kweon, M. Watanabe, K. Onoguchi, Y. Kuno, "A Behavior-Based Intelligent Robot in Dynamic Indoor Environments", In the Proceedings of IEEE International Conference on Robotics and Automation (ICRA), May, 1992. I. Kweon, T. Kanade, "Extracting Topographic Terrain Features for Outdoor Mobile Robots", In the Proceedings of IEEE International Conference on Robotics and Automation(ICRA), April 1991.